SERIOUS BUSINESS COVERED. House Committee meetings, especially on high profile issues like dangerous drugs, are usually covered by the media. Above, Rep. Erico Aristotle Aumentado (Bohol, 2nd District), pushes for the inclusion of the island municipality of President Garcia as a site of treatment and rehabilitation centers that government intends to build throughout the country. Foto: Rep. Aris Aumentadoâ€™s Facebook Account. President Carlos P. Garcia, an island town off the northeastern tip of Bohol, will be prioritized in the funding for the construction of drug treatment and rehabilitation centers throughout the country. This after Rep. Erico Aristotle â€œArisâ€ Aumentado (Bohol, 2ndÂ District) pushed for the inclusion of the town in the sites for treatment and rehabilitation of the rising number of drug surrenderers. While some need only counseling, some who are confirmed addicts who want drugs to be out of their system and their craving controlled, need rehabilitation. 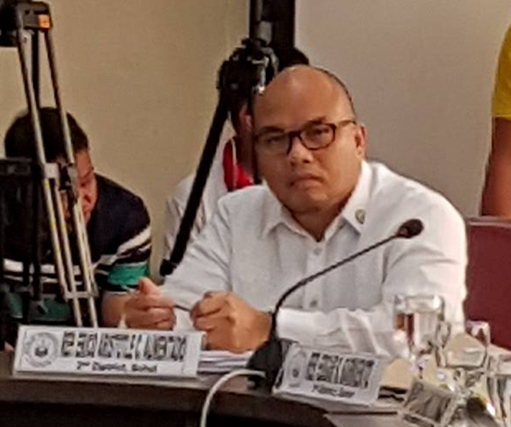 During the meeting Thursday of the House Committee on Dangerous Drugs chaired by Rep. Robert Ace Barbers (Surigao del Norte), Aumentado said the island is strategically located in Central Visayas. Being an island, it deters patients from escaping treatment and rehabilitation as transfer to the mainland is cumbersome and easily detected. The move is seen to hasten the development plan of the provincial government of Bohol to turn each of the 10 devolved hospitals into a specialization center. Aumentado said the committee passed a resolution, for consideration in plenary, to establish treatment and rehabilitation centers for the now almost one million drug pushers and users nationwide who surrendered following OperationÂ Tokhang. TokhangÂ meansÂ toktok-hangyo, wherein the police knock or the doors of suspected users and pushers and ask them to stop their illegal trade and drug abuse originally done in Davao City whe President Rodrigo Duterte was still mayor there. The re-elected solon said he had filed a bill to the effect during his first term as congressman. â€œI hope we can address the problem (treatment and rehabilitation of drug addicts) the soonest possible time,â€ he said.